The day was wet, the night windy and gray – but the future looks bright for Med City FC. 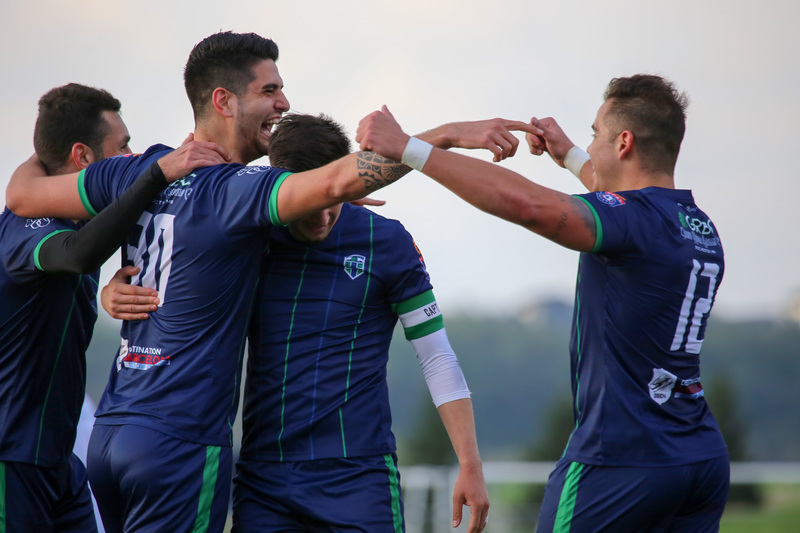 The nonleague encounter with Union Dubuque FC, a team that plays in the United Premier Soccer League, ended with Rochester’s National Premier Soccer League team winning 3-1. Last year Med City finished fourth in the NPSL’s North Conference with a 7-3-4 record. Early in the season, Med City looked like it would rampage through its maiden campaign atop the league standings and surely into the playoffs. Instead, the team got complacent, and a late-season swoon saw the Mayhem miss the playoffs. Francisco Neto’s attempted shot is blocked by Union Dubuque FC defender Anthony Berardi. Photo courtesy of Louis Livingston-Garcia. New coach Neil Cassidy isn’t worried about the team’s nadir last season. Cassidy brings a wealth of experience to his new role. The Manchester, England native was on the Med City coaching roster last year. He has also been the Director of Coaching and Soccer Operations for the Rochester Youth Soccer Association for 17 years. Plus, he has seven years of coaching experience as current head coach of the Saint Mary’s University women’s soccer team. And the PDL Rochester Thunder team stationed in Rochester in 2009 and 2010 was directed by him (Minnesota soccer fan favorite Kentaro Takada played for that team). Tactically, Med City will focus on possession, staying airtight at the back, and, according to what was said from the sidelines all night, plenty of pressing. After only seven training sessions, and with 10 or 15 more players yet to join the team, Cassidy is happy. “(When) we lose the ball, on the transition side of things we need a little work… when we go from attack to defense,” Cassidy explained, identifying a weak point. Claudio Repetto (30) celebrates his and Med City’s first goal of the season, assisted by Francisco Neto (12). Photo courtesy of Louis Livingston-Garcia. Claudio Repetto benefited from the squad’s strong display by notching the team’s first goal of the season. With his back to goal, he deftly headed a short cross at the near post over oncoming keeper Lewis Moston. 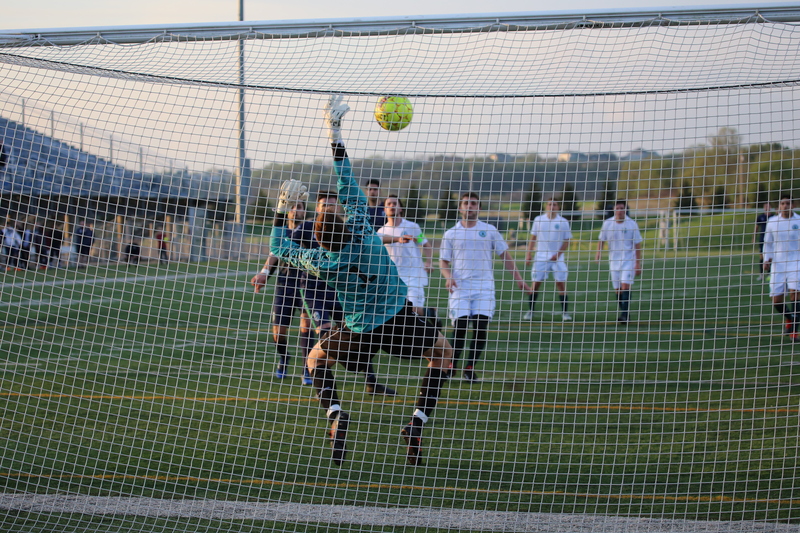 Med City FC’s captain Midhat Mujic (Mido) gets a second chance to shoot at goal after his penalty kick is saved Wednesday, hitting the underside of the crossbar. Photo courtesy of Louis Livingston-Garcia. 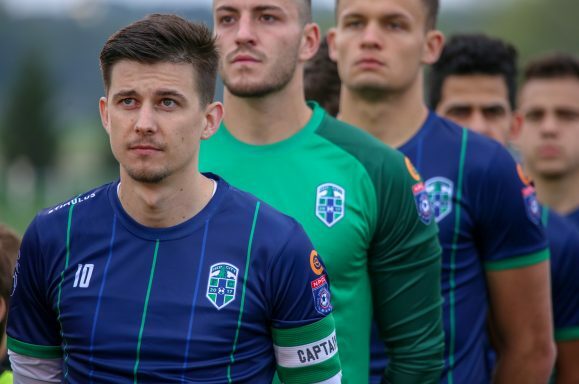 Outside of the match, Med City FC General Manager Frank Spaeth hopes to get more people in the stands (Med City typically had around 600 people in the stands last season, but about half on Wednesday), and will focus on more community activities, beginning next week. Youth clubs will also find some players visiting their practices. 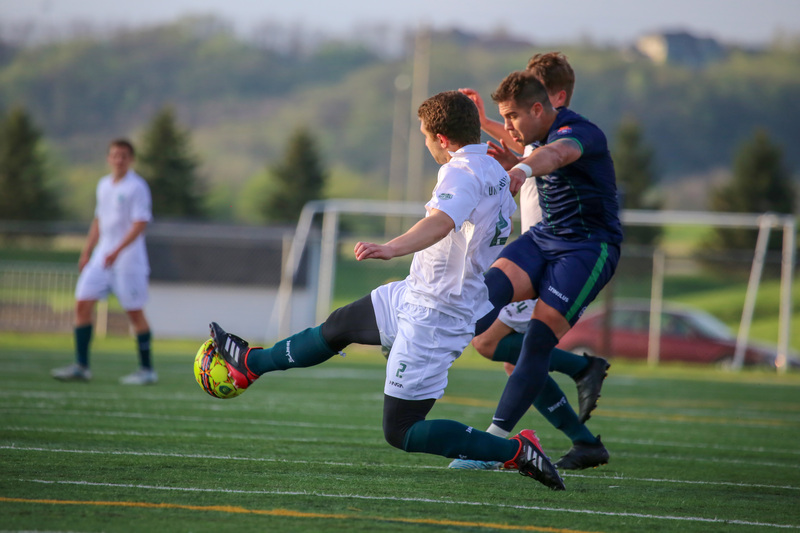 Med City FC returns to the pitch on Saturday when it visits Minneapolis City SC.